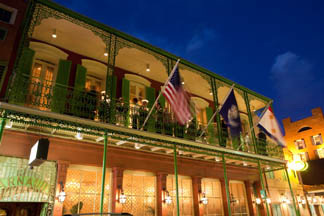 Arnaud's restaurant located in the heart of the French Quarter of New Orleans, Louisiana has been a dining tradition since 1918, where old-world elegance, ambience, and impeccable service by tuxedoed waiters add to the family-owned restaurant's mystique. Chef de Cuisine Tommy Digiovanni focuses on classic French recipes and puts his own mark on innovative Creole dishes, and graciously shares Arnaud's recipes for Oysters Arnaud, Duck Ellen in Blueberry Sauce, Pompano Duarte, and Trout Amandine to provide a delectable taste of the restaurant and New Orleans. Some chefs are born into the culinary world; Chef Tommy Digiovanni is one of them. A New Orleans native son, he has great memories of working at his father's restaurant, The Little Italian Restaurant, beginning with standing on crates to wash the dishes and later moving up the culinary ladder. Eager to learn more, when he was 18 he honed his craft by attending culinary school in New Orleans at Delgado Community College, followed by an apprenticeship at The Fairmont Hotel in New Orleans, where he had the opportunity to work with many classically trained European chefs. After working as an apprentice for one year, and with his experience he garnered working at his family's restaurant, he was quickly promoted to Sous Chef. From there, he progressed, always working on perfecting techniques and learning from each experience, working as a Sous Chef at Arnaud's with Arnaud's then Chef de Cuisine Andre LeDoux, followed by the Royal Orleans Hotel where he was the Executive Chef, then back to The Fairmont where he was the Executive Sous Chef, and coming full circle to work at Arnaud's as the Chef de Cuisine, where he has been since 1997. I had the opportunity to experience Chef Tommy Digiovanni's culinary style during my stay in New Orleans in July 2011, when I had dinner at the restaurant. He is a chef who is in his mid-40s and describes himself as stilling having "the fire and gusto in me. If you have an intense drive, and push yourself, it pays off." He credits the Food Network and other food-related programs as opening up people's minds to new foods no matter where they are from, and feels that this is a "heyday" for being a chef. He is dedicated and passionate, and feels that one needs to keep striving for new approaches. At Arnaud's, the type of food they serve is very classical, and are old recipes. The challenge is to maintain a high level of consistency, so that if someone returns and orders what they had in 1952, it will be as good as they remember. When he does change a few things on the menu, it is after much testing and trial and error before the recipe makes the menu. When not working in the kitchen, Chef Tommy Digiovanni likes to enjoy time with his family. They recently took a trip to "the Smokies" (Great Smoky Mountains) where he and his wife and two children went white water rafting, which was a first for him, but he loved it. Riding the rapids was tame fare, however compared to his experience later that evening after he had been grilled t-bone steaks for his family, when a black bear came around to visit. Apparently, even the black bear had heard of Chef Tommy Digiovanni and perhaps wanted to experience his cuisine. 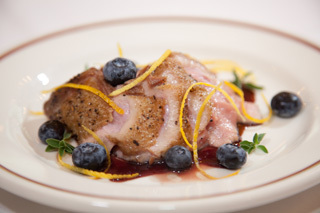 Chef Tommy Digiovanni graciously shares a delicious taste of Arnaud's. Bon Appétit! Oysters Arnaud includes five different recipes for baked toppings. 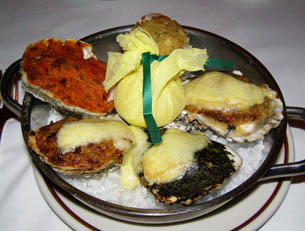 They are Oysters Bienville, Oysters Rockefeller, Oysters Kathryn, Oysters Ohan and Oysters Suzette. Oysters Kathryn was created and named for Casbarian's, Katy, and Oysters Ohan was similarly devised in honor of the late Ohan Casbarian, beloved patriarch of the Casbarian family and Katy's grandfather. Each recipe is included here: however preparing them all at once may be a daunting task. Presentation of just one recipe is still a singular pleasure and easier on the cook. The toppings may be made a day in advance and refrigerated, then used to crown the waiting oysters before baking them together, and then serving immediately. Method: In a large, heavy saucepan, warm the vegetable oil and sauté the chopped mushrooms for about 4 minutes, stirring throughout the cooking process. Remove the mushrooms from the pan with a slotted spoon, press with another spoon to remove excess liquid and set aside. In the same pan, melt the butter over low heat and sauté the garlic and shallots for about 3 minutes, stirring frequently, until softened. Add the diced shrimp and stir to mix, then sprinkle evenly with the flour. Stir together, add the reserved mushrooms and increase heat to medium. Stirring constantly, deglaze the pan with the brandy. Stir in the cream and cook for 2 to 3 minutes, until smooth. Stir in the Romano Cheese, dry breadcrumbs, parsley, salt, a touch of black pepper, and the Cayenne, to create a soft moundable consistency. A small amount of milk may be added if the mixture is too thick. Preheat the oven to 400 ° F. Wash the oyster shells well and pat dry. Drain the oysters and place one in each of the 24 shells, or use two smaller oysters per shell if necessary. Place the shells in a large, heavy roasting pan lined with a ½-inch layer of rock salt, or place six filled oyster shells in each of four pie pans lined with salt (the salt keeps the shells upright during cooking and stops the delicious juices from escaping). Top each oyster with on generous tablespoon of the Bienville mix and bake for 15 to 18 minutes, or until nicely browned. The shells will be extremely hot. Presentation: Carefully place 6 oysters on each hot dinner plate. Garnish with a wrapped lemon wedge and serve immediately. Method: In a medium sauté pan, melt the butter over medium heat and cook the bacon until the fat has been rendered and bacon is crisp, about 5 minutes. Add the celery, green pepper, garlic, and onion, and then stir and sauté until the vegetables are softened, 4 to 5 minutes. Stir in the bay leaves, thyme, cayenne, and parsley, and then drizzle with Herbsaint and continue cooking for 1 minute. Reduce the heat and simmer for 2 minutes. Remove the bay leaves, add the basil, and season to taste with salt and pepper. In a blender or food processor, puree about half of the mixture, and then stir it back into the original pan, mixing thoroughly. Transfer to a covered container, cool to room temperature and refrigerate for about 1 hour to firm the mixture. Wash the flat oyster shells well, and pat them dry. Drain the oysters and place one in each prepared shell. Place the shells in a large, heavy roasting pan lined with a ½-inch layer of rock salt, or place six oyster shells in each of six pie pans lined with salt. Top each oyster with one generous tablespoon of Rockefeller sauce and bake for 15 to 18 minutes, until nicely browned. The shells will be extremely hot. Method: In a mixing bowl, combine the chopped artichoke hearts, breadcrumbs, egg, cream, basil, Parmesan Cheese, lemon juice, and garlic. Season to taste with salt and pepper and combine thoroughly using a fork. Cover and refrigerate for at least half an hour and up to 2 hours. Preheat the oven to 400 ° F. Scrub the oyster shells well and pat them dry. Drain the oysters and place one in each shell. Place the shells on the large, heavy roasting pan (or place six oysters in each pan of rock salt). Top each oyster with a generous tablespoon of the topping mixture, smoothing it into a mound. Bake for 15 to 18 minutes, until the tops are nicely browned. The shells will be extremely hot. Presentation: Carefully place 6 oysters on each hot dinner plate (or, if baked in pans of rock salt, place each pan on a dinner plate). Garnish with a wrapped lemon wedge and serve. Method: In a large heavy skillet, sauté the bacon with the green peppers, onion, and celery. Stir and cook for 5 to 7 minutes until the bacon fat is rendered, and the vegetables are soft. Pour off the fat. Add the pimiento, fish stock or oyster liquor, lemon juice, Angostura Bitters, and thyme. Bring to a boil and cook for 5 minutes. Meanwhile, in a separate small saucepan prepare the "roux" by cooking the butter and flour together for 5 minutes, stirring occasionally to ensure even cooking. Blend the roux with the vegetable mixture and stir until thickened. Transfer the cooked mixture to a glass or ceramic bowl. Cool to room temperature, and then refrigerate for about 1 ½ hours, or until thoroughly chilled. Preheat the oven to 400 ° F (204 ° C). Place the shells in a large, heavy roasting pan lined with ½- inch layer of rock salt, or place six filled oyster shells in each of four pie pans lined with salt (the salt keeps the shells upright during cooking and stops the delicious juices from escaping). Top each oyster with one generous tablespoon of the Suzette mixture and bake for 15 minutes. The shells will be extremely hot. Carefully place 6 oysters on each hot dinner plate. If baked in pie pans of rock salt, place each pan on a dinner plate. Garnish with a wrapped lemon wedge or halves and serve immediately. Method: Using a nice sharp vegetable peeler, peel the eggplants, scoop out any seeds and finely chop. Place a large sauté pan over medium heat and add the olive oil. When it is hot, add the eggplant, Andouille, shallot, yellow pepper, onion, and celery. Sauté the mixture until the vegetables are softened and the onion is transparent, about 10 minutes. Add the garlic and cook for one minute more. Add the wine, chicken stock, and bay leaves, and simmer the mixture until almost all of the liquid has evaporated. Stir in the cayenne pepper and white pepper, thyme, marjoram, and oregano, and cook, stirring, for 4 minutes more. Taste and season with salt and pepper as desired. Remove the bay leaves and cool to room temperature, then refrigerate, covered for a least 1-1/2 hours, to firm. Scrub the oyster shells well and pat them dry. Drain the oysters and place one in each shell. Place the shells on a large, heavy roasting pan. Top each oyster with a generous tablespoon of the topping mixture, smoothing it into a mound. Bake for 15 to 18 minutes, until the tops are nicely browned. The shells will be extremely hot. Presentation: Carefully place 6 oysters on each hot dinner plate. If baked in pie pans of rock salt, place each pan on a dinner plate. Method: Preheat oven to 400 ° F (204 ° C). Remove the giblets from the ducks and set them aside in the refrigerator. Cut off the legs and thighs from each duck in one piece (you will have four leg-thigh joints). Refrigerate until after you make the duck stock and the meat stuffing. With a sharp knife, working as close to the bones as possible, remove the breast in two pieces from each duck. Refrigerate the four breasts until just before serving time. With a heavy cleaver, chop the duck carcasses into 2-inch or 3-inch pieces and place in a roasting pan with the onion and carrot. Toss together and roast for 45 minutes, toss with tongs once or twice, until nicely browned. Transfer the bones and vegetables to a large pot and add the veal stock. Add the port to the roasting pan and deglaze, stirring up all of the delicious bits from the base and sides of the pan. Add the deglazing liquid to the pot and bring to a boil over high heat. Lower the heat and simmer very gently, partially covered, for at least one hour, preferably two. In a food processor, combine the reserved livers and gizzards with the chilled veal and pork. Puree for about 30 seconds, scraping down the sides of the bowl, and add the egg. Season with a large pinch each of salt and pepper and continue to process to a smooth puree. Add the cognac and port and blend until smooth. Preheat the over to 375 ° F (191 ° C). With a very sharp knife, cut open the duck leg pieces from the back, all the way from top to bottom, and remove the bones. Always keep the knife scraping against the bone to be sure you do not leave behind too much of the meat. Fill the resulting pockets with the meat puree and fold the skin around it to enclose. Secure with toothpicks or cooking twine. Butter four 8-inch or 9-inch pieces of aluminum foil and wrap a duck leg in each one to make a firm package. Place the packages on a rimmed baking sheet and roast for 60 to 75 minutes until the internal temperature reaches 165 ° F (74 ° C).on a meat thermometer. Warm four plates in the turned-off oven. While the legs are roasting, make the sauce in a large, heavy saucepan. Stir together the sugar and water, cook the liquid over high heat, stirring at first until the sugar dissolves, and then to a medium-dark, syrupy caramel. As soon as the caramel is brown, stand back and add the vinegar (it will splatter). Add the blueberries and continue cooking until it is thick and syrupy, about 5 minutes. Strain the duck stock into the caramel mixture, pressing down on the solids to extract all the juices. Stir together and simmer for 5 minutes to marry the flavors. Keep warm, and covered. Place a large skillet over high heat and add the peanut oil. When it is very hot but not smoking, add the duck breast skin side down, and cook for 1 minute. Remove from pan and remove the skin from the breasts. Return the skinless duck breasts to the pan and sauté for 3 to 4 minutes per side, until firm and only just slightly pink at the center, or to taste. Presentation: Slice each duck breast into ¼-inch slices and fan out on each plate opposite the unwrapped, stuffed legs and a generous spoonful of the blueberry sauce. Method: Preheat the oven to low heat and place six dinner plates inside to warm. Assemble the Garlic Butter, herbs and spices, tomatoes and Beurre Blanc Sauce near the stove. Place a very large skillet (or cook in batches) over high heat and add the clarified butter. Season the fillets with salt and pepper, and sauté, without crowding, for 2 to 3 minutes on each side, until golden (total cooking time will depend on the thickness of the fillets). Transfer the pompano to a platter and keep warm in the oven, loosely covered with aluminum foil, while you make the sauce. Add the garlic butter to the same skillet used for cooking the fish and place over medium heat. Add the crawfish and cook until they turn pink, about 2 minutes. Spoon off the excess butter from the pan and add the chopped herbs, red pepper flakes, black pepper, and tomatoes. Cook for 2 minutes, stirring occasionally, and then stir in the Beurre Blanc Sauce. Presentation: Spoon the sauce and shrimp over the pompano and serve immediately, providing the hot plates at the table. Method: In a food processor or an electric stand mixer, mix the butter until smooth. Add the chopped garlic and process until smooth, then add the Herbsaint, chopped parsley, and salt and pepper to taste. Mix until completely smooth and all of the liqueur is absorbed; this may take 3 to 5 minutes in a stand mixer, but will take less time in a food processor. Taste for seasoning and adjust if necessary. Method: In a small saucepan, combine the wine, cream, shallot, and place over medium-high heat. Bring to a boil, and then reduce the heat to low. Simmer gently until reduced to about 2 tablespoons, watching carefully, for about 10 minutes. Set aside for up to one hour before finishing the sauce, if desired, or finish immediately. Place the saucepan over low heat to warm through, if necessary. As soon as it is steaming, add all of the butter at once and swirl the saucepan or whisk the sauce continuously until the butter is thoroughly absorbed and the sauce is smooth. Remove from the heat immediately, and stir in the pepper and chives. Use within 10 minutes or keep warm, covered, in the top of a double boiler over hot but not simmering water for up to one hour, stirring occasionally. 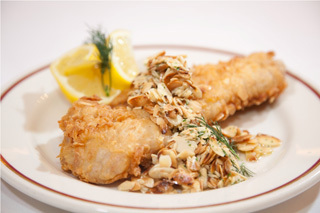 This buttery combination of trout and sliced almonds is a New Orleans favorite. Sautéed or fried, whichever way you prefer it! Method: In a small skillet, melt a ½ cup of butter over low heat. Add the almonds and stir gently until they are golden brown for 5 to 7 minutes. Remove the almonds from the pan, place in a bowl, and set aside. Add the remaining butter to the same skillet. Once the butter has melted, stir in the lemon juice and parsley. Add salt and pepper to taste. Set aside while you fry the fish. Place the flour in a large bowl and season generously with salt and pepper. Heat oil to 350° F in an electric deep fryer or a deep, heavy saucepan. Dredge two of the fillets in the seasoned flour, coating both sides. Shake off the excess flour and gently lower the fillets into the hot oil. When the first two fillets are golden brown, remove with a skimmer basket and transfer to a towel-lined baking sheet to drain and keep warm while you fry the remaining fillets. Important: Do not dredge the fillets until just before frying or the coating will be gummy. Return the lemon-butter sauce to high heat and stir for a minute or two, until piping hot. Place each fillet on a hot plate and scatter generously with almonds. Drizzle with some of the lemon-butter sauce and serve all at once. Alternative Method: This tasty dish can also be sautéed, whichever you prefer. To complete this New Orleans classic, serve the Trout Amandine with roasted asparagus and Brabant potatoes, and your guests will feel as if they are dining in an authentic New Orleans Restaurant. Bon Appétit! Arnaud's is open for dinner nightly from Sunday through Thursday from 6:00 pm until 10:00 pm. They have extended hours until 10:30 pm on Friday and Saturday. On Sunday there is a four-course "prix fixe" Brunch with Dixieland Jazz from 10:00 am until 2:30 pm. Jackets are suggested for gentlemen. 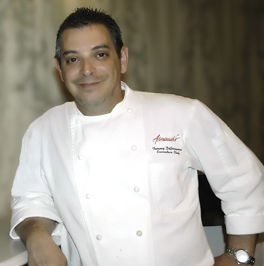 Read about Arnaud's in the Restaurants section. © October 2011. Luxury Experience. www.LuxuryExperience.com. All rights reserved.